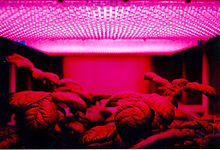 Why did NASA use LED grow lights to grow food in space? For the same reason that Indoor Growers use hydroponic LED grow lights to grow on Earth – because of the numerous advantages of LED grow lights over traditional systems such as metal halide, high pressure sodium and T5 bulbs. LED grow lights use a lot less energy and that is a critical point when you are growing in space or at home. LED grow lights do not waste energy by giving off a large heat signature like the high intensity discharge bulbs do which again ties in to less energy consumption. Lastly, environment control is very important to NASA scientists. The amount of space they have to work with is very limited so eliminating ballasts, fans, and venting systems is a tremendous advancement for growing food in space. NASA is preparing for the future colonization of the Earth’s moon and possibly other planets. For colonization to succeed there must be sustainable food production. The technology of choice for NASA is to grow food with LED grow lights! For professional growers and hobbyists alike – you can be proud that your indoor growing techniques will one day be used by humans living in space! To get started with LED grow lights for indoor plants see the 240 Watt LED Grow Light. This entry was posted in LED Technology. Bookmark the permalink.